///M Car Coasters! Accessorize your BMW with these useful car coasters to keep your cup holders clean and dry. These coasters absorbs condensation from cold drinks, constructed with non skid bottoms that grips to the cup holders! Fits all BMW cars & SUV’s that comes with a cup holder. 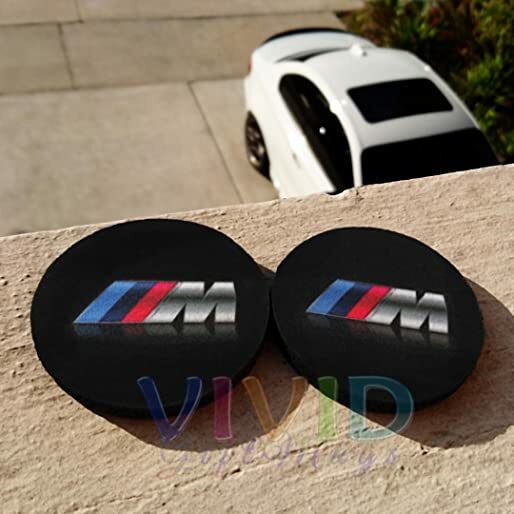 The perfect accessories to add to your vehicle or as a gift for any BWM ///M Lovers!Set of 2pcsSize: 2.625″w x 0.25″h – Coasters are slightly smaller than the cup holders for easy removal. – Coasters are made slightly smaller than the cup holders for easy removal.Item Color: BlackWashable (Hand Wash)Please note that this item is an accessory manufactured by us, and we are not affiliated with BMW in any way. ///M Car Coasters! Accessorize your BMW with these useful car coasters to keep your cup holders clean and dry. These coasters absorbs condensation from cold drinks, constructed with non skid bottoms that grips to the cup holders! Fits all BMW cars & SUV’s that comes with a cup holder. The perfect accessories to add to your vehicle or as a gift for any BWM ///M Lovers! Set of 2pcs. Packed in clear reclosable bag. Size: 2.625″w x 0.25″h – Coasters are made slightly smaller than the cup holders for easy removal. Please note that this item is an accessory manufactured by us, and we are not affiliated with BMW in any way.